The ASUS S Series Ultrabooks are starting to reveal themselves. 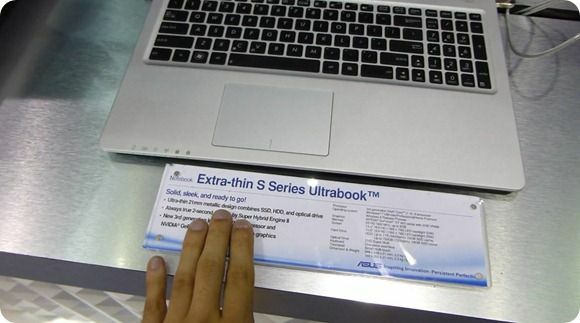 The S46 and S56, 14” and 15.6” devices have been filmed at Computex. The S56 weighs 2.3KG, comes with Ivy Bridge 17 or 15 CPU, Win 8 is planned, The Nvidia GeForce GT630M is inside and you’ve got hard drive options up to 1TB or 256GB SSD. Display resolution is confirmed at 1366×768, Glossy. The battery is replaceable. Check out the hands-on videos below. ASUS Series S S56 first, followed by the ASUS Series S S46. More information in this article (includig pics) and look for the S56 and S46 in the database soon.